Pune temperature is increasing day by day. Pune has highest March temperature in 14 years. It was recorded 41degrees celsius, Can you believe? Besides, the weather is also very dry. So we need the proper care of our skin in such weather. 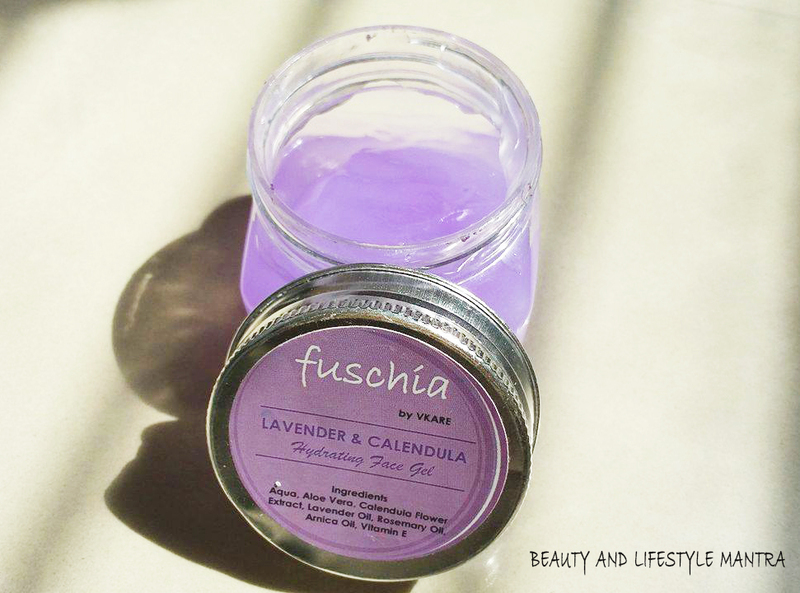 Recently Fuschia Lavender & Calendula Hydrating Face Gel works wonder on my skin and it really helps to beat the heat, definitely, it works as a hydrating face gel mask! I have received this gel in my January Violet Box and I have been using this gel for 3 months. 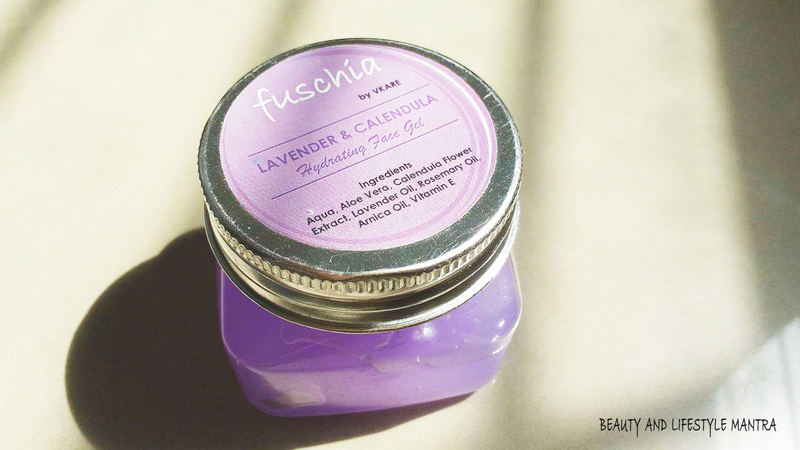 Today I’m reviewing the Fuschia Lavender & Calendula Hydrating Face Gel and share my experiences that how it works on me. Let's get details. Pure aloe pulp moisturizes & heals the skin. Lavender essential oil soothes, hydrates & tones the skin. Calendula extract moisturizes the skin & gives a youthful glow. Use these face gel once or twice a week. Apply a layer of this mask even over your skin and relax for 15-20 minutes. 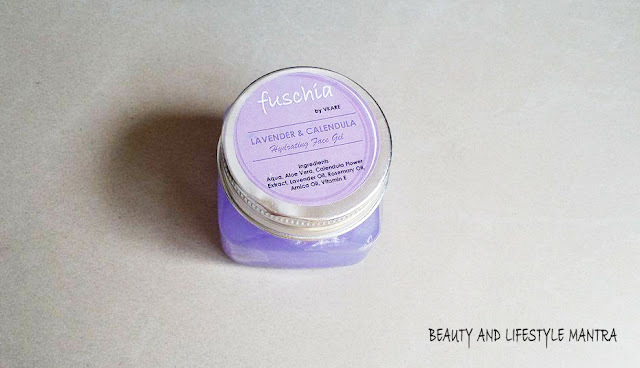 Fuschia Lavender & Calendula Hydrating Face Gel comes in a transparent plastic tub with a silver screw cap lid. It contents 100g product inside. Due to the size and tight cap, it can be easily carried around in a bag. 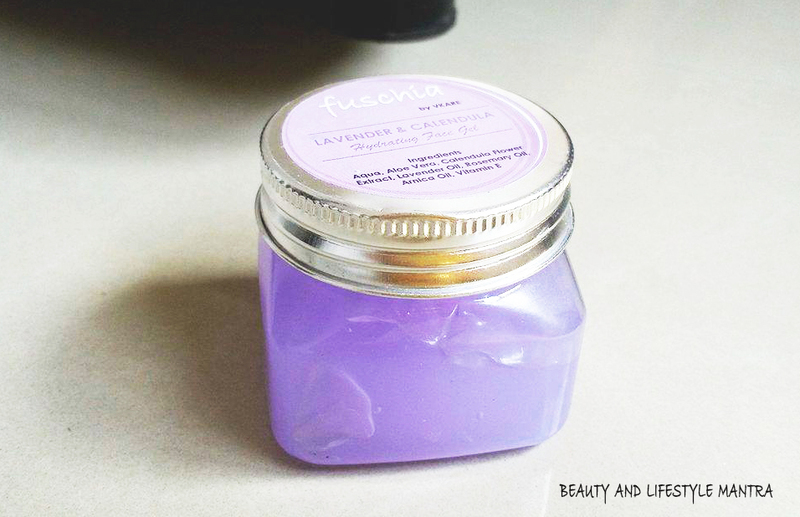 The gel looks very soothing lavender color with amazing fragrance. Personally, I like the smell very much. I found that the texture of the hydrating face gel mask was just impressive. It is much lightweight when to attach to the skin. It was so easy to be spread on the skin, smoothly and evenly without leaving any slippery feeling or any sticky residue behind. The lightweight face gel has a medium consistency which is neither too thick nor too runny. It gets absorbed almost instantly. During application, the gel gives a nice, refreshing cooling sensation onto my skin. Which I really like. I usually use this hydrating face gel at night just before going to sleep. One of the reason behind of this to relax my skin and have a good sleep. Before use this gel I clean my face properly, after that I use a scrub to get rid of my dead skin. After these two steps, I apply a layer of this gal even over the skin and relax for 15-20 minutes. Once it dries I take some water on my palm and massage my face in a circular motion for one minute and wash off with normal water. The results are incredible. The gel designed to nourish, hydrate and liven up the dull and lifeless skin. Tobe honest it makes my face hydrated and moisturized as well. As I told before I use it at night, so next morning I am waking up with soft supple and fresh skin which is really good! This gel repairs my skin overnight. To some extent, the gel helped to remove blemishes. I love using this around 2-3 times a week and it leaves my skin so soft and beautiful. It's great for this summer weather in order to hydrate the skin because that is important to maintain your skin nice and healthy as well as protect your skin from overseeing with the hot summer sun after a day. I have dry skin and during the winter time, I have very dry skin and it's not attractive at all. So even after applying this hydrating face gel mask, my face felt tight. Overall, I really love how it works on the skin. 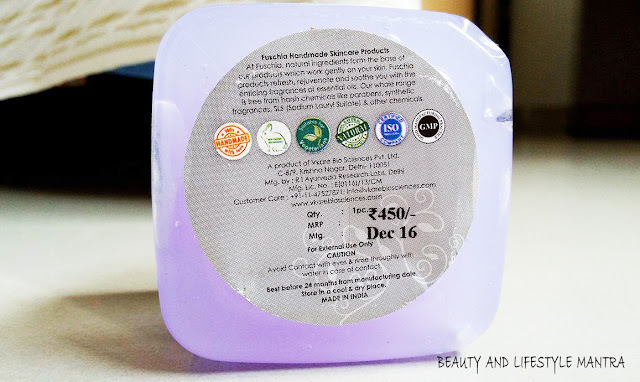 This herbal gel is a multi-beneficial gel. The texture is a thin cooling gel like that is easy to apply and absorbs very quickly. It's not oily at all, not greasy. It's gentle on the skin. It nourishes my skin and feels it so smooth and soft. It works great as an immediate remedy for those with a hectic lifestyle. Also smells amazing. I prefer to use this fuschia lavender & calendula Hydrating Face Gel in the Summer (not for winter). I will buy it again and would recommend for any skin type! A definite beauty must-have! Amazing review. I will also buy and apply at night as you are doing. Thanks. I love how it looks. Nice review. Color of the product is so soothing. This gel can be a good option for summer.